Many childhood memories revived!!! Years back, mum n aunties all together used to make sundried papa n sev in bulk :D From that list, Khichiya Papad has been my favorite for all time… & I specifically participate in making of those just ‘coz I get to eat bowls of “Khichu” during those hours on terrace… hehehe!!! Due to health issues, mum no more make them in batches like she used to but whenever I ask her, she makes khichu quickly for me! I got a pack of rice flour last weekend to make modak on Ganesh Pooja… More, I use it for dusting while making rotis (a useful tip from my mami). But other than that, I hardly make chaklis or any other snacks using it. 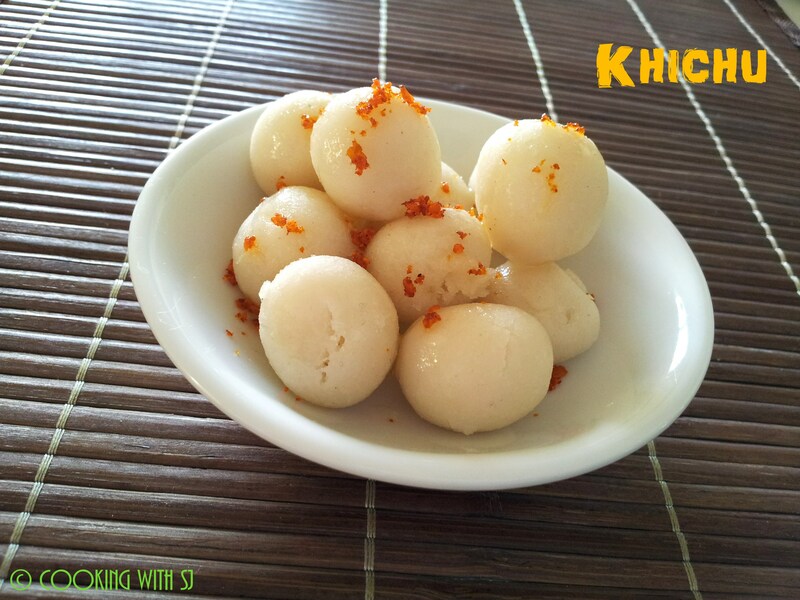 Planned to make a spciy n delicious “Khichu” after making modaks… Here is a quick n easy recipe for you to try it! Boil water salt, ghee and cumin seeds in a big non-stick vessel. Add rice flour gradually in it and keep stirring to avoid lumps. Mix it well. Cover it with a lid and cook for nearly 6-7 mins or until you get a soft dough out of it. Transfer it to a bowl and take a small portion in hand and make small balls. Arrange them in a greased idli steamer and steam for 10 mins. Take them out and serve hot with oil and pickle masala. me and my huby don’t like this so never ever make this , I also use rice flour while making rotlis. love the balls though.